Check Out This Congressman Telling a Constituent to ‘Shut Up’Republican Joe Barton of Texas made a request, and it was not honored. Mitch McConnell Employs Turtle Strategy to Avoid Town Hall TurmoilThe Senate Majority Leader is peeking very carefully at Kentucky constituents from inside his shell. At Town Halls, More Crowds Face Off Against Republican LawmakersRaucous constituents challenge senators and representatives on ACA and Trump. Republicans Accuse Protesters of Organizing for Political ChangeConservatives are now arguing that protests are illegitimate if they’re planned in advance by activists. Women Got All Up in This Virginia Congressman’s ‘Grill’ at Rowdy Town HallRepresentative Dave Brat heard from those women Tuesday night. These Republicans Faced ‘So-Called Angry Crowds’ at Tuesday’s Town HallsWhile scores of GOP lawmakers are avoiding their constituents, a handful attended packed public events back home. Queens Republicans Like John Kasich Because, Really, Who Else Is Left?The anti-Trump, anti-Cruz candidate gives a town hall and grabs a slice in Howard Beach. 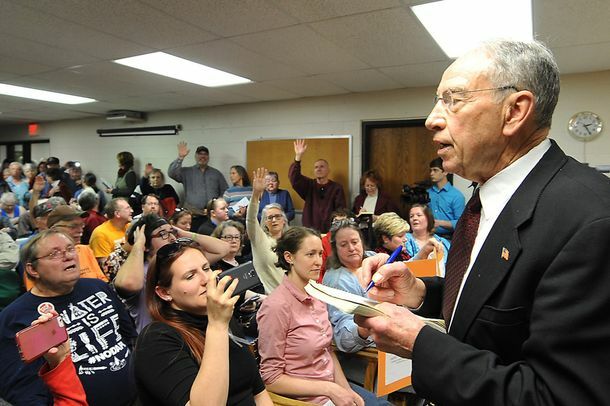 Republican Congressman Confiscates Cameras at a Town HallNow everyone hates him, even the tea partiers. Democratic Congressmen Avoiding Town Halls for Some ReasonThey’d rather just talk things out over Twitter. How to Talk to a Town-Hall CrazyBarney Frank takes one to school. Can We Just Stop Bringing Guns to Events Where the President Is Speaking?FYI, that is not the way to convince your peers that we should have less gun control rather than more. Surprise: Town-Hall Rabble-rousers Don’t Like the New York TimesAccording to a photographer, irate protesters don’t like the attention as much as you’d think. Craig Anthony Miller Will Probably Not Become a Republican Rallying HeroThe man who dramatically confronted Arlen Specter in Pennsylvania yesterday isn’t quite ready for prime time. People at Obama Town Hall Discuss Health Care Like PeopleImagine that. Authorities Keep Eye on Scary Dude Near Obama Town HallA scary dude is lurking around Obama’s town hall. President Obama Is Aware of Gossip GirlWe’re so pleased right now.